Vegetarian Mexican rice bowls are a colorful and fun way to mix up Taco Tuesday or any day! One of my favorite meals right now is the ever colorful Rainbow Bowl/Nourish Bowl/Buddha Bowl. They can be sweet or savory. Sometimes I make a thick smoothie base and top it with pretty lines of seeds, nuts, granola, and fruit for a nutritious and colorful breakfast or snack. Other times, like here, I use a base of greens, quinoa, or rice and top with a rainbow of ingredients. This recipe is ridiculously easy. In fact it’s really not a recipe at all. Let’s call it rainbow bowl inspiration. To make our vegetarian Mexican rice bowls, we start with a base of Mexican rice and black beans. As Spanish and Mexican rice if often not vegetarian since it’s made with chicken stock, I have a vegetarian Mexican rice recipe for you here. You can use canned black beans or cook them from scratch. I use canned when I’m making a last minute meal, but I always choose to cook dried beans from scratch whenever possible. I used to cook my dried beans in the slow cooker, but now I usually use the Instant Pot, which is so quick and easy. As a vegetarian, beans and rice are a staple in my house. Taco/burrito nights are just as much a staple, as it’s one dinner my kids are guaranteed to gobble up without any complaints. I love bowl meal dinner nights because I set all the ingredients out and let the kids make their own rice bowls. When they are a part of making their own meals, even if it’s just adding some guacamole, I find they are much more likely to enjoy it. 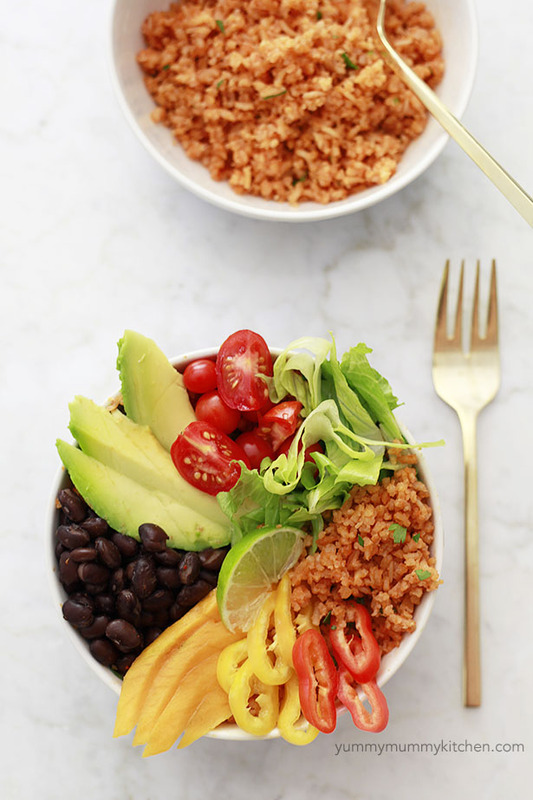 Mexican rice rainbow bowls are also a great “clean out the fridge” meal. You can top them with anything you would like. Grilled or roasted vegetables would be a wonderful addition during colder months. My personal favorite Mexican Rice Bowl toppings are guacamole, salsa, and shredded lettuce. What are yours? Colorful, nourishing, and delicious Mexican rice bowls with beans and veggies. Add rice to a individual bowls. Add seasoned beans. Arrange your favorite toppings and enjoy!